April 1947, Edwin H. Land demonstrating the Polaroid Land Camera's instant film. It’s a long-term exhibit on instant photography, and more. 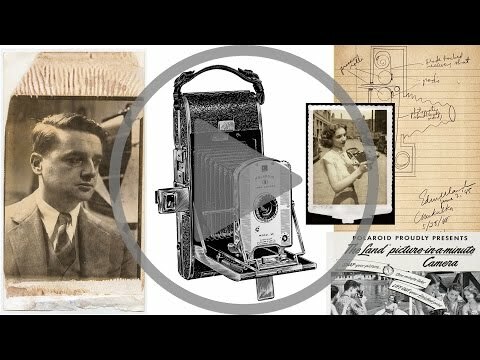 The Baker Library has mounted a show chronicling the history of the Polaroid Corp. and the career of its avant-garde founder, Edwin H. Land. Thanks to Polaroid donating its archives to the library in 2006, a collection of 1.5 million items stretching over 4,000 linear feet is at the fingertips of students seeking to learn from and be inspired by Land’s legacy. The archives made possible the exhibit, catalog, and research website for “At the Intersection of Science and Art: Edwin H. Land and the Polaroid Corporation,” said Laura Linard, director of special collections at Harvard Business School’s Baker Library. The exhibit, a photographic tour from the company’s fledgling days to its metamorphosis into a major corporation, features original patent documents, personal photographs, marketing materials, news releases, a well-preserved pair of Polaroid variable day glasses, and, of course, the Polaroid Land Camera Model 95. It’s an intriguing journey through the history of Land’s game-changing inventions, which pushed the frontiers of technology, business, and art. Having enrolled at Harvard College in 1926, Land took a leave of absence after the fall semester, moved to New York City, and delved deeper into his work on light-polarizing material. By 1928, he had figured out how to control scattered vibrations of light by using a magnetic field and microscopic crystals, a feat that had stumped physicists for decades. This discovery had tremendous applications for decreasing light glare at night, polarized sunglasses, camera filters, desk lamps, windows, 3-D motion pictures, and optical devices. Land received his first patent for synthetic polarizing material in 1933, when he was 24. He argued that industry should be “dedicated to the discernment of deep human needs,” and hence should do its best to fill them. Moreover, he defined greatness as giving “the world a wonderful and special way of solving unsolved problems.” Land cherished the ability and freedom to reflect deeply on such problems, and saw science as an essential tool in solving them. After dropping out of college, Land partnered with his physics instructor, George W. Wheelwright, and formed the Land-Wheelwright Laboratories in 1933, gradually building a gifted team of scientists, public relations experts, and marketers. Hefty investments from Wall Street magnates such as J.P. Morgan and Averell Harriman enabled Land’s startup to be reincorporated into the Polaroid Corp. and to heavily invest in research. World War II boosted Polaroid’s sales to unprecedented levels, fully mobilizing the company’s employees for the war effort. Focusing its energies on producing polarizing filters for gun sights, periscopes, binoculars, variable-density goggles, and infrared night vision, Polaroid helped to shape war strategy. Another Polaroid product, vectographs, allowed for the viewing of 3-D aerial photos, revolutionizing reconnaissance missions. After the war, the company had to quickly reorganize to compensate for a slump in revenue, spurring perhaps its best-known innovation: instant photography. The one-step photographs took the country by storm thanks in part to expert marketing and foolproof instructional literature. Land was something of a Renaissance man: a scientist, artist, businessman, and industry leader, who created one of the most innovative, research-grounded, and humanist companies of the 20th century, propelling it to remarkable success. A beacon of entrepreneurial triumph and progressive leadership, Land wanted his company to exist at the intersection of science and art, which it did for decades. The exhibit captures Land’s trailblazing spirit and the myriad ways in which Polaroid changed people’s lives. The exhibit, housed in Baker Library / Bloomberg Center’s north lobby, will be open to the public until July 28, 2017. For more information, visit the exhibit website. Jorge Olivera Castillo is a writer and journalist and a well-known Cuban dissident. He was sentenced to prison by the Cuban government for his political views but was released after 21 months. He is now at Harvard through the Scholars at Risk program.